SCIENTIFIC NAME: Order Lepidoptera, family Sesiidae, Synanthedon spp. 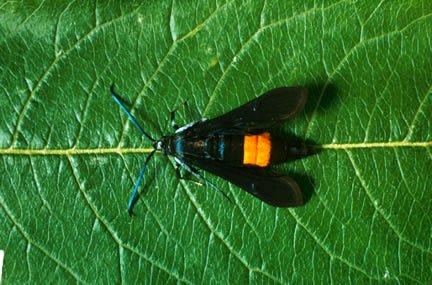 IDENTIFICATION: Adults are clear-winged, narrow, blue-black wasplike moths with yellow marks. Eggs are brown or gray and laid in bark or in the soil near the base of fruit trees. Larvae (borers) are white or pale yellow caterpillars with brown heads. They burrow into the tree trunk near the ground line. BIOLOGY AND LIFE CYCLE: One generation a year. Larvae hibernate in tree burrows or in soil. They pupate in burrows or in brown cocoons in the soil. HABITAT: Peach, plum, apricot, cherry, and other fruit trees. FEEDING HABITS: Borers chew inner bark of lower tree trunk. Mass of gummy sawdust appears at base of trees. ECONOMIC IMPORTANCE: Damage to tree trunks. Vectors of wilt fungi and other diseases. NATURAL CONTROL: Healthy soil, compost, thick mulch over root system. Ichneumon and other predatory wasps. ORGANIC CONTROL: Tobacco dust (snuff) or sticky tape around base of tree. Squirt beneficial nematodes into holes. Treat soil with beneficial nematodes. Paint tree trunks with Tree Trunk Goop. INSIGHT: This insect is easy to control by keeping plants healthy, but it has become the poster insect for the wrong approach to pest control. In forty years and three separate orchards, Malcolm has never seen a peach tree borer in any of his organically grown trees.